The idea is that the person sitting down to answer the questions does so in the spirit of playfulness and generosity of personality. Think the ending of “Inside the Actors Studio,” or two schoolkids huddled over a magazine questionnaire. Not so with Sir Arthur Conan Doyle, the late author of the Sherlock Holmes series and, apparently, very taciturn old grump. In his day, the questionnaire was a bit of fun, a parlor game. Seemingly, though, not one Doyle was keen to be roped into. All in all it’s an amusingly annoying response, and an insight into Arthur Conan Doyle, the man. Probably the only kind of answer to be expected of the man who joined an Arctic whaling expedition at the age of twenty, the journal of which can be seen here. A Kipling-loving, manliness-embodying Hemingway figure before Hemingway ever existed. What do you think of Doyle’s answers? 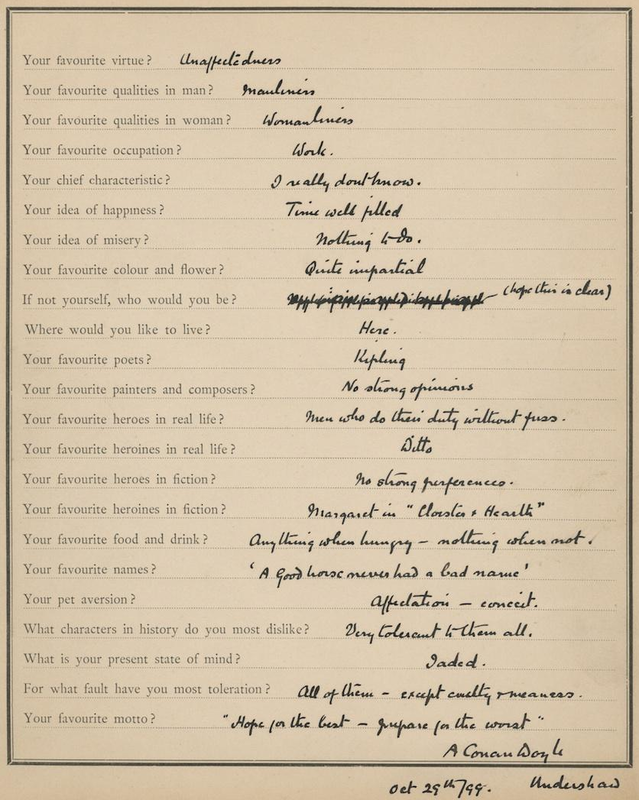 Know of any other authors’ responses to the Proust Questionnaire? Tell us in a comment!